Join us at the Art Station for our children’s painting class, Paint N Cookies! 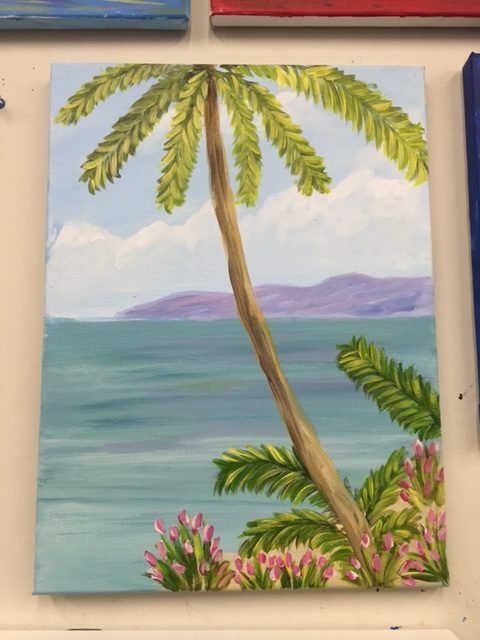 This week we will be painting a beautiful beach with a palm tree and flowers in the foreground. The Class is taught by owner, Regina, and/or her assistants Julienne and Adrianna. “Paint and Cookies” is the most unique art program for kids ages 5-16 in Brooklyn. Since we opened in April 2013, over 10,000 kids have joined in on the fun, and most of them are weekly students! Whats special about our kids art classes is the sessions only last 1.5 to 2 hours and the students walk out with a finished painting on the spot! The students take a “cookie break” in the middle of the session (snacks/drinks are on us!) The perfect way to introduce painting to your children is through our kids art classes in Brooklyn NY! Your child will learn from the painting class about mixing colors and various brush and painting techniques. The class walks your child through the painting process from start to finish by step-by-step instruction. Please call ahead of time to reserve a seat for your child and allow our class to run smoothly. In addition Kids Birthday Party are held in the back your choice of canvas or plaster painting. When you call to reserve for any Friday class, don’t forget to confirm the time. *IT IS RECOMMENDED THAT YOU MAKE A RESERVATION FOR KIDS ART CLASSES TO GUARANTEE YOUR CHILD HAS A SEAT! ADULTS ! check out our Adult Painting Party section. *EVERY WEEK WE TEACH A NEW PAINTING! PLEASE REFER TO SCHEDULE BELOW TO SEE WHAT PAINTING IS NEXT!